We were able to buy this house because the first person who tried backed out of her deal when she found out it did not have a working heat pump. When we got a quote, we found out it would cost us $5,000-10,000 to get a new system installed. Talk about sticker shock, but we knew it wouldn’t be cheap. I was okay with owning a house without a heat pump. I grew up in a home without one – my parents didn’t install one until I was away at college (isn’t that how it always works?). I also grew up with a wood stove as our primary heat source and I LOVED IT. After 7 years at the townhouse with a heat pump, I had determined I was not a big fan of a heat pump. The air coming out of it always seemed cold and I could never warm up. I missed the wood stove. 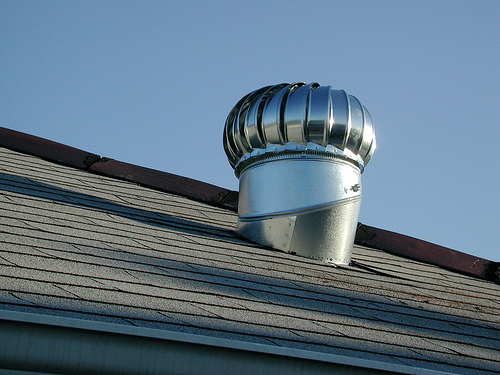 Barry, however, grew up with one and felt like we needed it to regulate the air inside the house – not to make it super cold or super hot, but just make it livable. So, we began to save up for the heat pump. It took us about 3 ½ months. It was actually installed when I was in the hospital with Andy. I will admit, when 8 months pregnant it’s difficult to live in 90+ degree temperatures in your house. It got hot…and I sweat…a lot. And so, we saved. In the meantime, Barry’s wonderful aunt got us a housewarming present – a whole house fan. Barry had heard of them and was impressed. I had never heard of them, but I wanted one after he sang their praises. So, basically it’s a big fan you install in the ceiling in the center of your house. It has attic access. It’s VERY strong. So, you turn on the fan and open the windows. It gives a good breeze all through the house when the temperature allows. Its purpose is to pull in the cooler air from outside the house, forcing the hotter air up into the attic and out roof vents. Make sense? In other words, when it is cooler outside than inside, open the windows and turn on the house fan. Instant relief. It is AMAZING! I love you, whole house fan! So, guess what? These fans are a very good way to save money on the cooling in your home. It can save the average family $300 a year in electric bills. Considering a normal fan of this nature costs about $250-400 plus installation, that’s a good return on your money. How is that? In the morning or at night when it cools down, you turn on the house fan. It brings the cool air in – you run it 15-30 minutes to cool off the inside temperature. This means you’re not relying on a heat pump to do the work. A house fan is usually used alongside a heat pump – using the heat pump when it’s hot inside and out and you can’t rely on the fan. BUT, you’ll use your heat pump a lot less if you also use the house fan, relying on the whole house fan when it cools down outside. Most new house fans are MUCH quieter than they used to be. Mine doesn’t bother me at all – and it’s only on for a short amount of time. Well worth the payoff. 🙂 The one we purchased uses a direct drive motor which is a bit noisier than some alternatives, but still not an issue. NOTE – In the winter, you will need to install a fan cover (usually from the attic side) so that your heat does not escape through the fan into the attic. Yep – I could have done without that heat pump. 😉 Especially since a chimney sweep came and fixed our chimney up for the winter. I’m all set and ready to go! So – you might consider installing a whole house fan this summer for your home…it will pay off. Thanks for much for commenting, Nicole!!! 🙂 I’m glad to meet you. I am unfamiliar with the Delta Breeze but it sounds heavenly. You mentioned quiet and this is so important. If you don’t use the newer quiet fans, you cannot run the fans at night when you sleep! 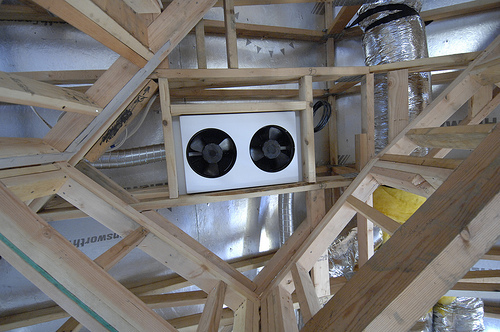 We installed several of the Quiet Cool Fans in our 3,800 sq foot home and we LOVE them! Heat loss? We have a cover for ours in the winter that goes over it in the attic so there isn’t any heat loss that way. Summer isn’t my fave. Spring yes. Winter no. Fall yes. Well, at least you get to use it for that right? 🙂 I burn stuff a lot. Ha! I pretty much love it. I never burn things. LOL LOL Oh my…that made me laugh. When we had our house built, we had them install a whole house fan. It is in the ceiling of the second floor, so it pulls in the cool air in order to cool the attic. Thus the whole house is cooler. We haven’t used the air conditioner once so far this summer. It’s been in the low 90’s here in central Ohio and we normally don’t get that hot until July and August. We also have an outdoor wood stove/boiler for heat with a propane furnace as back up. August is always the hottest here! That is what I adored about our last house…a whole house fan. We are hoping to move into a house of our own this fall & if there is not a house fan, we’ll see if we can put one in…we live in CO and except for a few weeks in the summer when we need A/C…we use the fan the rest of the time. It is WONDERFUL! We have an attic fan and love it. I grew up with one and when we bought our current house I was very excited to see that it had one. I live in Michigan and It seems that not many home have them anymore….but I can’t imagine not having one! Enjoy your new fan! We have….this is our second summer with it and we love it!! We just reciently purchased a home and I had no idea what that was in our attic. Thank you! 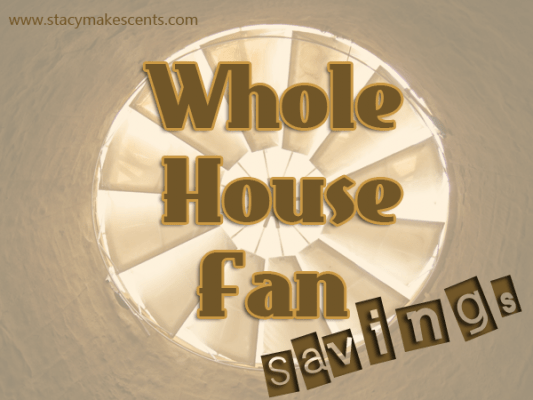 I too am a huge fan of the whole house fan (no pun intended). Also a fan of swamp coolers – we live in Colorado where it s quite dry and can get very hot in the summer. So use the attic fan at night to cool things off and bring in that cool evening air and the swamp cooler in the day time when it is hot and dry outside. So much cheaper than AC. Attic fan is also useful when you have the carpets cleaned and want to dry them out faster – pulls the moisture right out. I also admit to using the attic fan when I burn things on the stove – guilty as charged. I grew up in a house with no heat pump or A/C, too. We didn’t have an attic fan, either. I can remember some REALLY miserable summers. We had a wood/coal stove for heat in the winter and small fans for the summer. The fans didn’t do much, though. Me: Why can’t we get air conditioning like everyone else? I do miss the wood stove, though. It was really cozy in the wintertime. I agree with you completely. I grew up with a whole house fan and loved it. I really cooled and refreshed the house. Thank you! I grew up on a farm & we had no air conditioner or attic fan, that’s what we call them her in the mid-west. I remember using a box fan in my bedroom window at night to try & cool off! My grandparents had an attic fan & it did really make a big difference at night. I am now spoiled as we do have central air, but we live in a old farm house & the upstairs gets pretty warm this time of year. We have a small window AC in our kids room which is right next to the attic. We are hoping to install an attic fan soon so we can stop paying such high electric bills. We do heat with wood, our propane furnace for a back up. My husband purchased a used outdoor wood furnace at an auction about 4yrs. ago & we love it! We have a lifetime supply of trees to use for wood so it was a winner for us! Propane is so expensive & we have saved a lot of $ over the past 4 years! When we built our home in the early ’80’s, my dad gave us a what we call an attic fan (same thing you refer to in your post). We were so excited about it. However, it seemed every time we used it, our daughter got sick. The doctor advised us to close the windows to the outside elements that were being pulled into the house. The fan also makes the house much more dusty, so . . . there it (the fan) sits in the ceiling. The only time I ever use it is if I burn something in the kitchen and need to pull the smoke out of the house.